Finally, after all this worrying about what would survive our recent unusual freezing weather, there are some good signs that many plants seem to have survived and are returning. Since our last big freeze, which was about ten years ago, I have planted many plants that have survived our occasional hard freezes without any trouble. Here, in south Louisiana, many flowering plants that are annuals in more northern climates can often survive our usual mild winters. 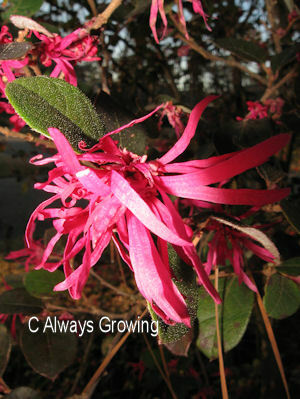 It is not at all unusual for pentas, impatiens, blue daze, etc to survive our normal winters. 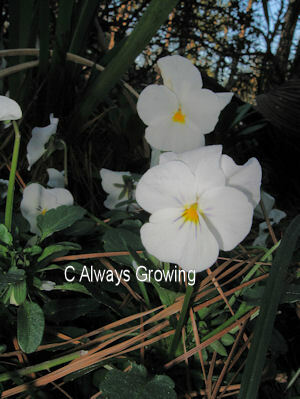 In fact, I have not bought any impatiens in over five years because some always survive the winter. Not this year, though. Also, I have put in the garden many plants that I am not quite sure if they will survive the extra cold winter we have had this year. I have been concerned about some favorites that seemed to have died, not so much because I can’t plant something else, but so often a particular color flower or variety is no longer readily available. Well, today I saw some very encouraging signs of life out in the garden. First, my pineapple sage, which I have had for over ten years, is coming back. My sister gave me cuttings from her garden all those years ago, and I would have been so disappointed if it died. But, I don’t have to worry, little plants are coming up all over where it was planted, and a few stems (which looked dead a week ago) are showing little leaves. We had two moderate freezes this past week, but that isn’t stopping plants from waking up for springtime. 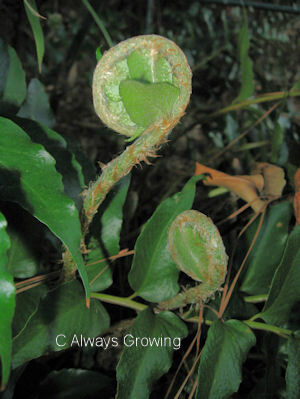 The holly ferns are coming alive and sending up fiddleheads. 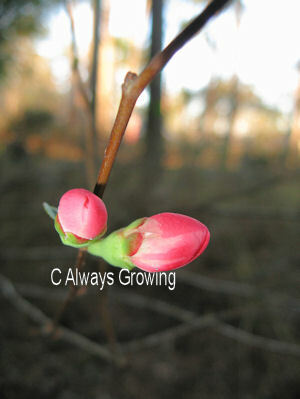 The flowering quince is starting to bud and bloom, too. 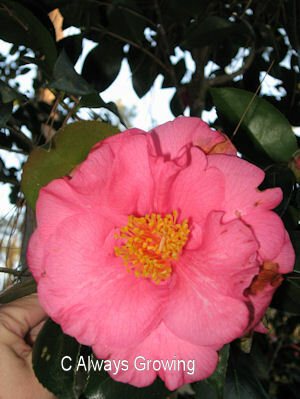 One of the most anticipated periods in winter is camellia season. 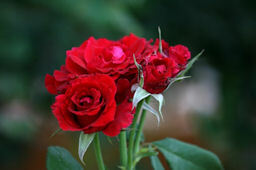 Usually, these lovely flowers start blooming in early winter, and the bloom period often can last into late winter. 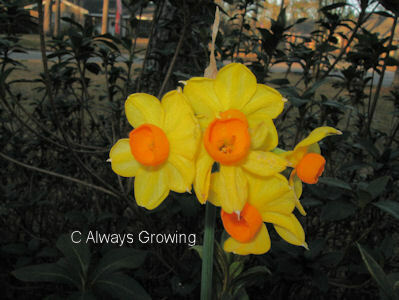 We did have some flowers that started opening in early December, but then with the cold snaps, they stopped. All the buds remained firmly shut tight. 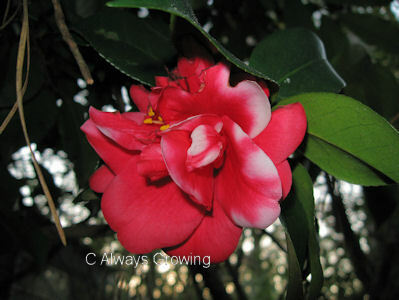 By late February normally, the camellia blooming season is winding down, but not this year. 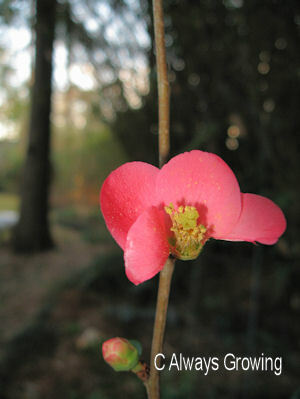 Many of these winter bloomers are only starting to bloom now. Finally, something besides the old-fashioned pink camellia is starting to show up. This afternoon, I was able to find a few of the red and white camellias that have opened. In checking the all red flowering bush though, I found it will take a few more days of warmer temperatures to coax those buds to open. Patience will be required for a few more days, and I can hardly wait because I really need some flowers now. How do you picture Mother Nature? Right now, I am picturing her as a teaser. The last few days have been much more what we are used to for mid-February. 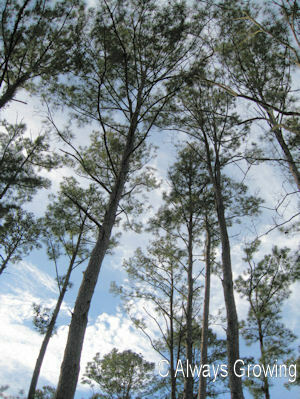 Sunny skies, highs in the mid 60’s. It seems like spring is here. I even saw a lizard in the garden yesterday, sunning himself on the hose reel. We are seeing more and more signs that spring is coming soon. 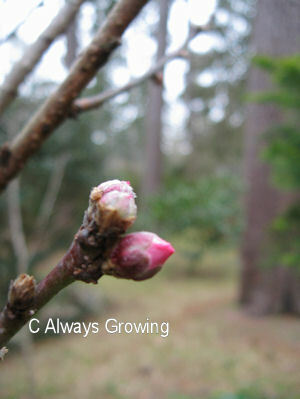 The peach tree’s buds are showing color. 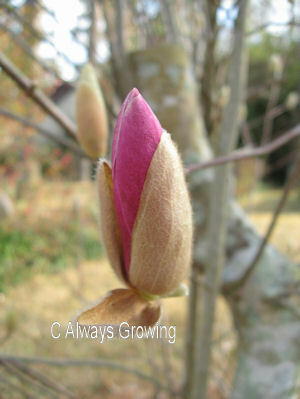 The neighbor’s Japanese magnolia’s buds are also showing color. 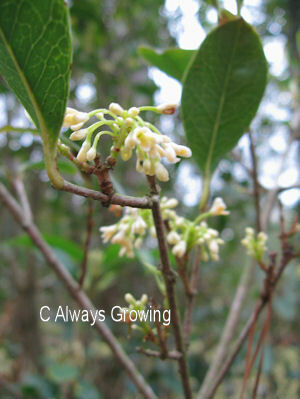 The sweet olive bushes (Osmanthus fragrans) have started blooming – a sure sign winter is coming to a close. I didn’t notice the small flowers at first, the fragrance caught my attention before the flowers did. So, why is Mother Nature a tease? While the temperatures reached 71 degrees today, colder weather will be here shortly bringing a stop to all these “spring-time signs”. How disappointing we will have to wait a bit longer for spring to finally arrive. Saturday was the first day in about four months that I was able to get outside and work in the garden. This past fall there were too many rainy weekends and, just like everyone else, the winter has been too cold to be outside doing garden chores. It felt so wonderful to be outside making the garden ready for spring. Of course, it is not quite time to plant any annuals, so I spent the time cutting back every thing that had died during the last big freeze. All the ginger had to be cut back, the both the variegated and green shell ginger as well as the butterfly gingers. I cut back the rest of the agapanthus and trimmed back the toad lilies as well as some of the bamboo. One thing that surprised me while I was cleaning up was the signs of life. It has only been in the last three days that we haven’t had at least a light freeze, so seeing any signs that there is life in the cold ground is nice. 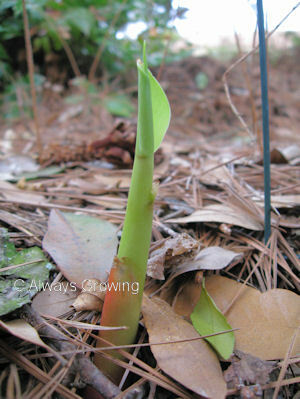 Most of the garden seems to be dormant, but the butterfly ginger is already sending up shoots. 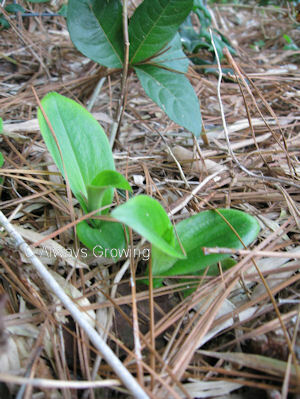 The toad lilies are sending up new plants, too. I don’t know if these new ones are seedlings (I let the seed heads stay on) or if the clumps are spreading. Either way, I can always use some more toad lilies. Some trees are starting to show swelling flower buds, so it won’t be long before the peach trees and Japanese magnolias will be blooming. Spring is on the way! Thanks to Carol of May Dreams Gardens for coming up with GBBD. This is the day (15th of the month) in which we post everything which is blooming in our gardens. Unfortunately, for the second month in a row there is very little blooming here in South Louisiana. We are no longer having the hard freezes, but light to moderate freezes are still hanging around. I have a feeling that once our temperatures get back to normal, there will be an explosion of color as the garden comes alive all at once. It was very cold outside when I was trying to take these photos, and I was shivering, so please excuse the “quick” takes I did. Lorepetalum is still blooming despite the cold. Violas are still going strong. Small narcissus are still blooming. Only one camellia is blooming now. Others seem to be holding their buds closed till warmer weather arrives. 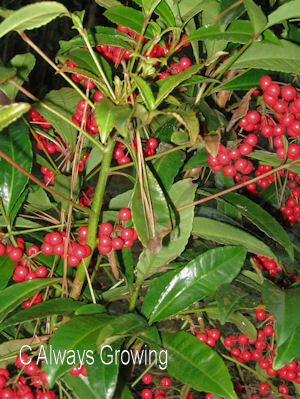 And, finally, while not flowers, the Christmas ardisia’s berries certainly are brightening up the place. I know I said this last month, but I am hoping that next month will be more normal when it comes to blooming flowers. 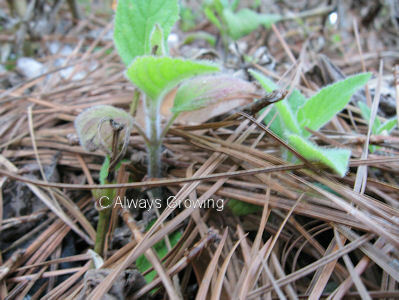 While we all are sure that spring will return and many dormant plants will awaken with warmer temperatures, it is those marginal plants that have died back in the cold weather that have us holding our breaths. It seems that it has been so much colder just about everywhere this year. 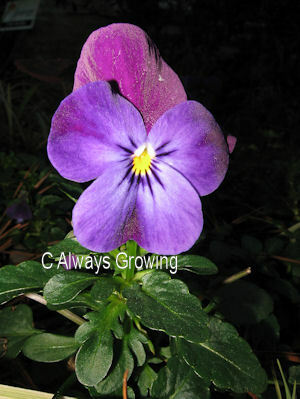 I know that I have had plants that have never had any trouble coming through our winters with its occasional freezes die back completely or have damaged leaves this year. 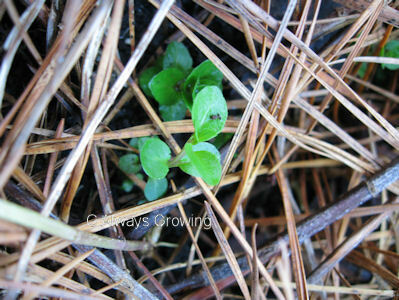 However, there are signs that even these plants seem to be coming back. 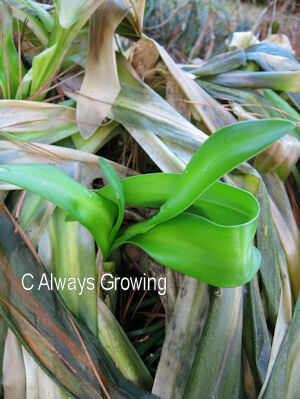 The agapanthus, which has never had any damage before, took a pretty good hit from the late December freezes. 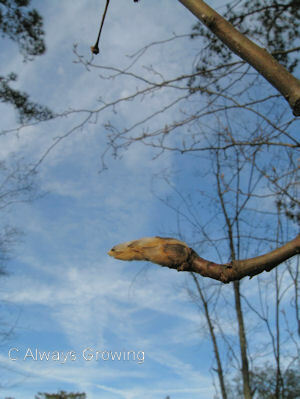 Thankfully, it is starting to show new leaves emerging. I don’t know if there will be flowers this year, we’ll just have to see. 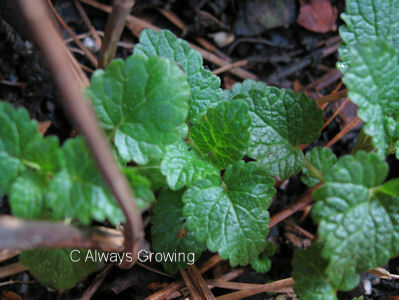 The lemon balm that I have had in a container for about ten years, is coming back also. Finally, I noticed that the mint growing in a large container is sending out new leaves. This was another plant I was surprised was damaged. It has come through so many winters without any freeze damage. Our temperatures this winter did not get that cold (mid 20’s) which isn’t unusual here, but the cold did last for 12 to 15 hours which is very unusual and we had five days of this. Normally if we get hard freezes, they usually don’t last but 4 to 6 hours before the temps are above 32. This year’s freezes over many hours and several days is what has knocked so many plants back. I am still looking for other signs of life around other plants. I am hoping most everything will come back. 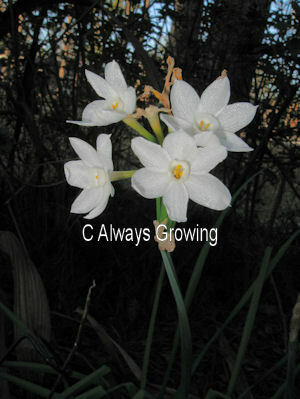 Since this is a garden blog, I feel that it should be about gardening, flowers, shrubs, etc. After last night’s Super Bowl, I just have to have something about the New Orleans Saints and how they have lifted the entire region’s spirits with their win. Everyone in Louisiana and the Gulf Coast is just ecstatic. This does help put Katrina behind us. Thank you Saints and the NFL (which really supported New Orleans after the hurricane). Now to have a tie in to gardening – the fleur de lis, which is the symbol of New Orleans and the Saints, means “lily flower” and seems to be a stylized version of an iris. It was predominately displayed on the royal French flag. It is thought to be the yellow flag iris according to Wikipedia. After last night, I think I just might have to plant some in the garden.